Supercharge your child’s memorization skills! 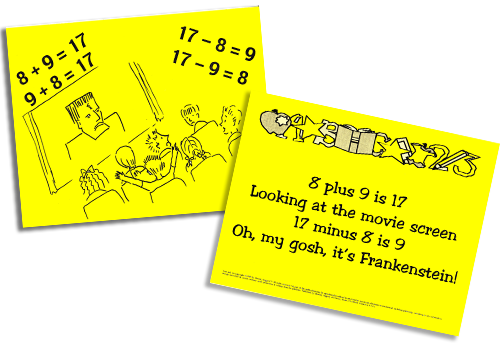 It’s the fast, fun and easy way to memorize multiplication and division facts! Nina (pronounced “nine-uh”) the porcupine is always represented by the number nine. The product, 72 sounds like “sent-to-the-zoo”. Each picture card tells a story on the back so the teacher or parent can read the story while the child listens and watches. It’s easy for the child to remember the story and make associations with the numbers as they see and hear a fun and interesting story. Kinesthetic learners learn best by moving their bodies, activating their large or small muscles as they learn. These are the “hands-on learners” or the “doers” who actually concentrate better and learn more easily when movement is involved. Play games, take things apart and put them back together, clap and repeat information in rhymes, buy a plastic alphabet so they can touch the letters and put them together as words. Reading: Read together and then stop and bodily act out the scene or use puppets. Boredom with reading comes quickly so break up reading sessions. If there are new words, find the definition and act it out. For emerging readers, check out ZooPhonics. Their materials work perfectly with kinesthetic learners because it involves movement and sound. 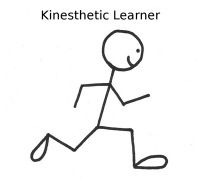 Enjoy your special kinesthetic learner. They will open up a new and exciting life experience for you and your family!